The recent announcement of the pending canonization of Blessed John XXIII and Blessed Pope John Paul II has people already planning to attend the majestic ceremonies at the Vatican. The canonization will take place on April 27, 2014. The ceremonies of Beatification and Canonization have become well-known to people, especially with the help of EWTN and other media sources who bring such events right to our living rooms. But what happens long before those public ceremonies, which are often held outdoors in front of St. Peter’s Basilica? There is a lot of background work that must be completed before the Church declares a person to be with God in Heaven, that is, declares them a saint. Earlier this summer, an event was attended over two days by about 350 people in Rome. It marked the Closing Session of the initial stage of the process of Canonization for His Eminence, the late Francis Xavier Cardinal Nguyen Van Thuan of Vietnam. Now known as a servant of God, the story of the heroic prelate is becoming better known. Even more, his saintly life has been studied and reviewed to determine if his life and virtues are worthy to be presented to the Sacred Congregation of the Causes of Saints for further study and presentation to the Holy Father. In the case of Cardinal Van Thuan, a formal meeting was held at the formal Sala in the Lateran Palace, which is adjacent to St. John Lateran Basilica in Rome, the Pope’s official Cathedral Church in the Eternal City. Cardinal Agostino Vallini is the Vicar General of His Holiness for the Diocese of Rome and, as such, presided over the final session of the study phase of Cardinal Van Thuan’s life, virtues and writings. Church law is specific as to the hearings conducted and sealed by officials of the Diocesan Tribunal of Rome. Present with Cardinal Vallini were a Delegated judge, an Adjunct Judge, a Promoter of Justice and the Procurator who is responsible for developing a case in support of Cardinal Van Thuan’s Canonization in the future. All the Acts of this case – the collection of thousands of pages of documents related to the late Cardinal’s life – are sealed in trunk-like cases and sent on to the Congregation. This part of the process requires a number of signatures and seals. After the formalities, a reception was held in the courtyard of the Lateran Palace. The morning session was solemn in tone and very official. Later the same day, there was a celebration of the completion of the first stage towards canonization. Cardinal Van Thuan’s pastoral letter on the Vatican Council II was introduced by Cardinal Peter Turkson of Africa. He serves as President of the Pontifical Council for Peace and Justice, the same office held by Cardinal Van Thuan when he died in 2002. There were three interventions, or commentators, to follow. Retired Cardinal Bernard Law gave an inspiring commentary on the spirituality of Cardinal Van Thuan. Subsequent reflections were offered on the social and theological implications of the late Cardinal’s teachings. Excerpts were read prior to each commentary, and a musical interlude was included at the end. Perhaps the most moving moment of the afternoon was the presentation of a replica of the Cardinal’s pectoral cross. While in prison, he fashioned a cross which he later hesitated to wear because it reminded him of his years of ordeal. In its simplicity, it speaks of the person of Cardinal Van Thuan. The replica itself could well inspire many more copies being made as the life story of the saintly Cardinal becomes better known. A magnificent concert followed in the Auditorium of the Antonium. The audience, mainly Vietnamese, appreciated the relief of the forty-minute concert which concluded the activities of the day. The second day of the ceremonies began with an audience in the Pope Clement VIII Room at the Apostolic Palace in Vatican City. His Holiness, Pope Francis, replied to the welcome address by Cardinal Turkson. The Holy Father then left his elevated chair and moved to another chair just in front of the distinguished guests, including Cardinal Van Thuan’s sister, Elizabeth. Pope Francis then blessed the audience before he left. For security reasons, the excited crowd waited for several minutes to ensure he had left the area. Later that day, the final event was a Mass at Santa Maria della Scala Church, the church entrusted to Cardinal Van Thuan when he was elevated to the rank of Cardinal. That same day, he learned that he was suffering from terminal cancer. The Mass was celebrated by a Bishop from the same diocese in Vietnam where the Cardinal served when he was a bishop in his native country. 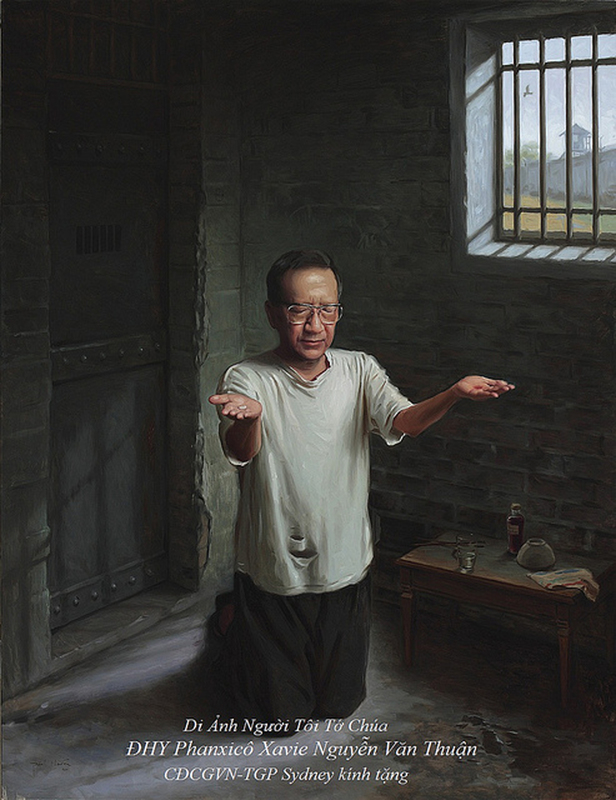 He later was named Archbishop and was imprisoned for thirteen years, nine of which were spent in solitary confinement. A story is often told that a guard smuggled wine and bread to him for the celebration of Mass. Having no chalice, the imprisoned prelate used the palm of his left hand. He had memorized the text of the Mass. Following the Mass at Santa Maria della Scala, the faithful went to near the entrance to the Church where Cardinal Van Thuan is buried. Many pictures were taken during all the ceremonies by a grateful community, devoted and praying for his canonization. There is a great deal of work that is never seen by the public in a cause for canonization. There are many who, by Church law, must be part of the final decision on the merits and virtues that result in the Holy Father declaring an individual a Saint of the Catholic Church. The process is usually very time-consuming. This is more true in the case of a person who has written and spoken much. For Americans, a good example of this is the Cause for Canonization of the Servant of God, the late Archbishop Fulton J. Sheen. In the case of Cardinal Van Thuan, writings were limited, although a few books have been published with his spiritual essays and shared throughout the world. Becoming a saint is not easy. The Church is deliberately slow in this process, and the faithful are very patient and prayerful at all stages. The result is the identification of more and more saints, men and women of great virtue, whom the Church holds up to us for emulation. The story of sainthood is alive and abundant in the present age. The forming of saints is evident today as never before. We all have the same opportunity to become saints as well. A life of virtue is a good start. Fr. James Walker is the Pastor of St. John Vianney Parish in Gallup, NM.